Measurements on revolving propeller-like wings, simulating the flapping downstroke of hovering, suggest that animals can produce surprisingly high lift (for the size and speed of their wings). This appears to be because ‘stall’ is delayed due to some 3-dimensional air motions – animal wings do not act like conventional aeroplane wings or helicopter blades. But this high lift comes at a high cost in terms of power, presumably why engineers have not been particularly interested in the phenomenon. Direct measurements of the pressure differences between upper and lower surfaces of flapping bird wings show that, at least in slow flight, birds do indeed fly inefficiently – a helicopter of similar size and weight would require much less power. But exactly where this balance might fall, and whether it applies at higher flight speeds, presents an exciting area of research. See below for recent measurements on faster flight. Bird muscles generate an impressive amount of power during flight. This can be very useful for scientists trying to work out how muscles work, and how we might use our muscles better. – it requires relatively little investment. Unlike birds flying in neat V-formations, pigeons flap at a higher rate – and so presumably with higher metabolic cost – when flying in a flock. Usherwood, J.R., Stavrou, M., Lowe, J.C., Roskilly, K. and Wilson, A.M. (2011). Flying in a flock comes at a cost in pigeons. Nature 474, 494-497. doi:10.1038/nature10164. 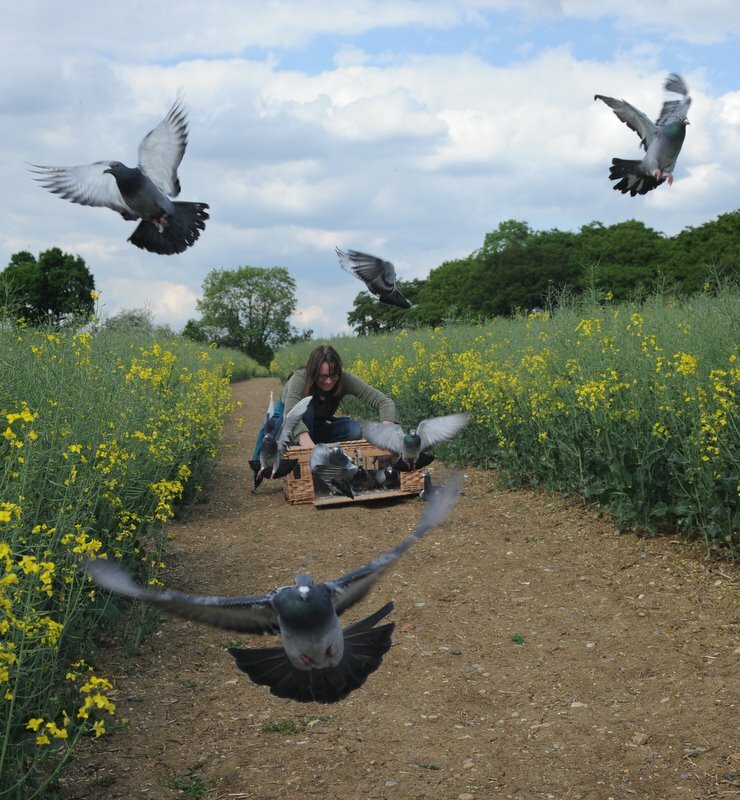 The flocking study involved measuring body motions, body positions and wingbeat frequency of free-flying pigeons using back-mounted GPS, accelerometers and gyroscopes developed at the Structure and Motion lab. Free-flight obviously confounds many variables including speed, turning and position in the flock. But with over 243,000 wingbeats measured, these effects can be taken into account and act as mini self-experiments. Every factor that requires more aerodynamic power – acceleration, climbing and turning – is associated with an increase in flap frequency. This is exactly as would be expected. But what is surprising, and perhaps highly revealing, is that in the case of turning, the amplitude of the body (how much it goes up and down – related to how much the wings go up and down) falls. When circling, pigeons bank just like aircraft, and experience and increase in effective body weight associated with centripetal accelerations. So turning pigeons are effectively heavier, and heavier fliers require more power to stay up. And one way to increase muscle power is to increase frequency (which happens), but another way is to increase amplitude (which happens for other aerodynamic power requirements). 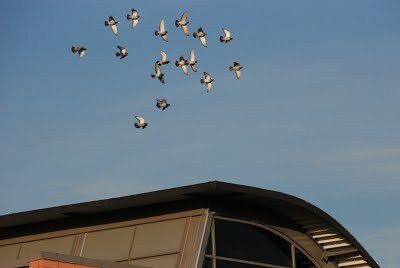 So why do pigeons decrease the flap amplitude? It appears to make no sense in terms of muscle power modulation. Our best answer so far is that there is a compromise between flying with high aerodynamic efficiency, which requires the wings to be outstretched and level most of the time, and flying without putting too much energy into accelerating the massive flapping wings. During circling flight – flight with increased weight – aerodynamic efficiency becomes relatively important, so the wings remain more level more of the time; during straight flight, the kinetic energy given to the wings is reduced by reducing frequency (but increasing amplitude). If this is indeed the case, then it appears that birds, even during cruising flight, should not be thought of as aerodynamically optimised.